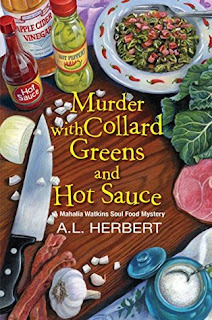 My Series Sunday pick is Murder with Collard Greens and Hot Sauce, the third book in the Mahalia Watkins Soul Food Mystery series by A.L. Herbert. We are back in Maryland for a beauty industry trade show. Business is booming at Mahalia's Sweet Tea restaurant. Customers are looking to satisfy their appetite after spending the day surrounded by beauty styles. Unfortunately, the moment fades when a beauty mogul/pop culture icon is found shot to death. The list of suspects is long! Mahalia and her trusty sidekick cousin, Wavonne, multi-task with solving the murder and keeping slow-cooked collard greens moving out of the kitchen. Hilariously, they are the black version of Daphne and Velma looking for clues. I have waited on this third book for what seems like forever! So imagine my delight when I saw an advance reader's copy was available for my review. To get in the zone, I fried a couple pork chops, smothered rice in gravy and onions, with collard greens and hot sauce on the side. My meal was just as good as the novel, but not the best. 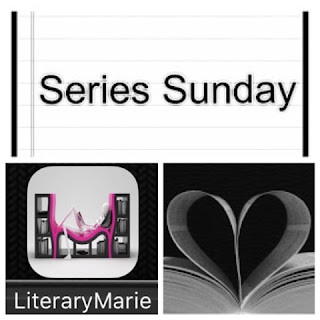 The first two books earned 5-heart ratings. I was hooked when I read Murder with Fried Chicken and Waffles. A strong follow-up was Murder with Macaroni and Cheese. So of course, I expected nothing short of page-turning in Murder with Collard Greens and Hot Sauce. Instead, the book was not very well-paced for a mystery. The murder didn't happen until almost halfway in. It didn't leave much time for Halia and Wavonne to sleuth, especially with so many suspects thrown in the mix. Still at 80%, I was ready for any character to just admit it already! Yes, it was entertaining but I wish the focus was more on solving the murder and less on background info/events leading up to the climax. Nevertheless, the Mahalia Watkins Soul Food series is recommended for readers that like a cozy foodie mystery. It is a good worthy read! As a bonus, there are recipes sprinkled throughout the novel for collard greens, Purple Rain iced tea, and smothered pork chops. One of these days I will try a recipe. But in the meantime, I will keep reading and using black haircare products!